Despite the lack of sleep, hubby and I had to get up early last Saturday to bring my car for servicing at Suzuki in Bangsar. They dropped us off at Bangsar Village while they did they servicing, which is very nice and convenient! 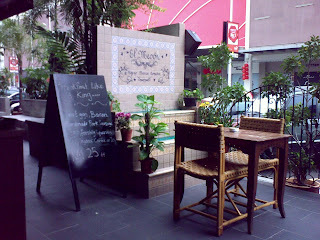 We walked over to El Meson which is just right in front of Bangsar Village 2. The Breakfast Like a King was rm 25 and I tried that. Hubby took the orange juice and black coffee that came with the set while I took a latte. Food was good especially for pork lovers. Hubby ordered something else like a chorizo thingy with egg & potatoes. They also had 2 types of newspaper so we enjoyed some reading time. 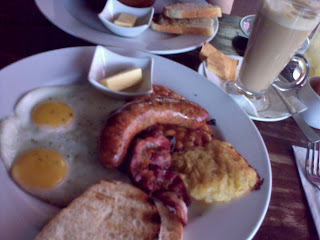 For 2 person we spent rm 59 for breakfast. Considering our last breakfast experience at La Bodega which costed rm 99, I would say the pricing of El Meson is more reasonable plus the fact it's non halal. Hubby and I walked back to Suzuki to pick up my car. A great way to burn those calories from the tasty breakfast! I chanced upon your blog while searching for more info on electricity/water suppliers in KL. My husband and I are "newly retired", he just turned 60 and I am 58, old enough to be your parents. Your stories and infos will be helpful to us and I am thanking you now. We have chosen to retire in KL and have acquired a unit in Mont Kiara. We'll go to KL end of this month for the handing over, and then to equip and furnish it. Like you, I am originally from the Philippines but left in 79 (rest of my family is in North America). 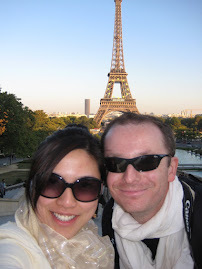 And like you my husband is French, married for 23 yrs. We have 2 grown-up children. We live half time in France, other half in Asia. You seem to enjoy living here, I hope we'll have the same experience. Thanks again.